Your mission matters – stand for it! Our missions drive our work. They represent why our organizations exist, capture what matters most to us, and define why we do what we do. Advocacy is critical to our success as nonprofits. All of us can advocate by actively representing our organizations’ missions and values and by creating public will for social change. Advocacy is a powerful lever for real impact, but, according to BoardSource’s Leading with Intent report, only 33% of organizations report that their board members are actively involved in advocating for their missions. 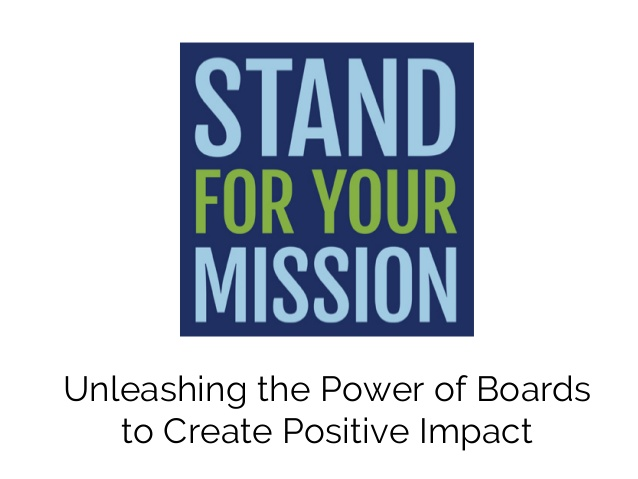 That’s why BoardSource, the Forum of Regional Associations of Grantmakers, the National Council of Nonprofits, Bolder Advocacy, and others have partnered to initiate the Stand for Your Mission Campaign. The Campaign seeks to unleash the full impact of the nonprofit sector by engaging board leaders directly in the advocacy work of their organizations. The most important action you can take is to start a conversation in your boardroom about how advocacy can accelerate the impact of your mission.